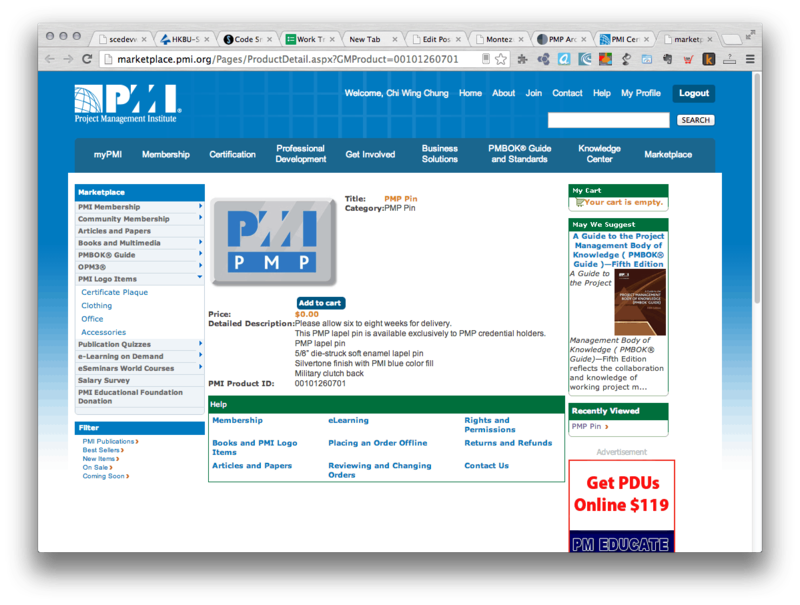 Introduction: This is the third part of posts documenting my actual PMP® examination experience. More information on the PMP® examination preparation can be found at my PMP® exam journey here. From the very moment you see the ‘congratulation’ message on the computer screen of your CBT PMP® Examination, you are a certified PMP® for a period of three years. You may not be able to check for your status from the PMI website at the moment, however PMI has given the privilege to you to use the PMP® credential from this very moment on. Depending on the timezone of your location, you may get an email titled ‘Congratulations, you have obtained a PMP®‘ in a couple of days (mine was received in 2 days). 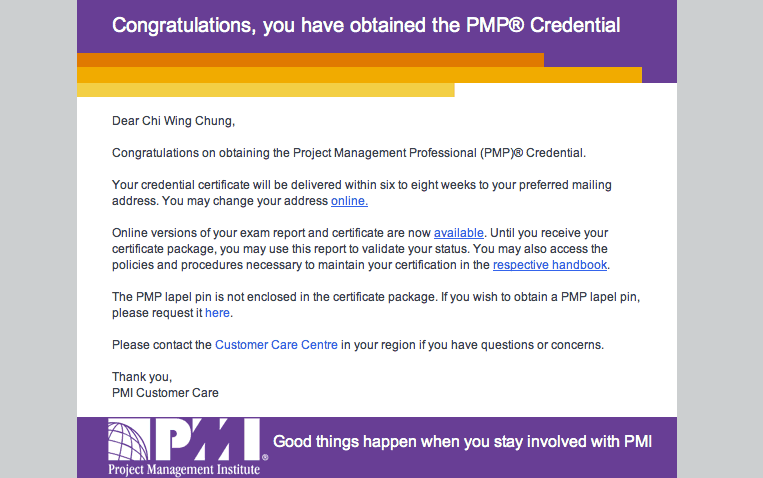 The email basically assures you that you are a PMP® now and the credential certificate will be mailed in six to eight weeks. In case you want to also get the PMP® lapel pin (nobody doesn’t, right?) you can order for free (postage included) at the PMI marketplace, which will also be received in six to eight weeks. You can also begin collecting your PDUs from the very moment of passing the examination. If you are also a member of PMI, you will also get another email a moment later advising the resources (mostly free) to gain PDUs on the pmi.org. Thank you Edward, we never meet, but your website really helped me a lot during my PMP journey. Congratulations Stephen. I would be grateful if you would share your PMP Exam lessons learned to fellow aspirants by email. Dear Ed, I’ve successfully cleared my PMP exam yesterday, and I would like to sincerely thank you for your contribution to all PMP aspirants. Your guidance on EVM helped me immensely to gain a very strong understanding of the topic and I nailed all the answers quite confidently during the test – and all credit goes to you! If you’d like me to contribute to your website going forward, please do not hesitate to let me know. I’d be more than happy to help. I thank you again from the bottom of my heart for the wonderful, wonderful website of yours! Thanks a lot for letting me know that my sharing did indeed help with your exam preparation. All credits should however go towards your strenuous efforts — I just share what I have acquired during my exam journey. It would be a great help if you would share this website to your friends / social network who are interested in PMP or project management. Hi Edward, I cleared my pmp today and want to thank your website/work for the loads of info it provides – got 4 MP, one P. the free tests and the scores you gave are quite accurate and a good benchmark (well, I just cleared the exam, I am addicted to using the terminology everywhere!). I felt my paper was very situational with few math questions thrown in here and there. CP was there in 4-5 Qs, with one question giving duration and cost of crash , asking to choose which activity to crash (had no idea, took a guess!). Another area was quite a few stakeholders like customer, project team, contractor asking you to make a change – add a feature, change or anticipated risk-related change – what to do next? I felt Simplilearn’s free exam was quite close to what my paper had ….quite a lot of situational questions; and would recommend “Andy Crowe’s – The PMP Exam: How to Pass on Your First Try” to other aspirants. Congratulations on passing the PMP exam in first try and thanks for sharing your PMP Exam lessons learned!